I could kill deer like that, too, if I were hunting inside a high fence." The middle-aged hunter's voice carried with it an air of accusation as he glared at the TV screen, on which an outdoor show host gloated over a buck he had just arrowed. While no doubt there are some shows filmed inside high-fence hunt operations, I knew this show host, and I knew the place he was hunting. It was no high fence. I had heard such accusations countless times before from hunters with whom I'd shared camp or a conversation, and while I understood some of the jealousy and distrust of watching somebody with apparent privilege, this guy's assessment was unfounded. It would have been more accurate to say that the show host was hunting at a top-shelf operation, one managed to minimize hunter pressure, which translated to more shot opportunities at quality deer. I have come to believe that the single biggest factor that affects deer habits and movement is hunter pressure. Minimize it, and you can enjoy seeing deer nearly every time you climb in a stand. Amplify it, and you are virtually guaranteed to see little to nothing just days into a season. About eight or nine years ago, the small group of guys I hunt with started to get serious about managing the deer on our farm. The effort began with the decision to let the smaller bucks walk, but it soon expanded to not only wanting to increase the quality of our bucks, but also the quality of our hunting experience. That meant mitigating evidence of our presence in the woods so that deer would feel comfortable moving about. Weeks prior to opening day and throughout the season, we no longer allow the driving of trucks around the property. Where hunters once drove to the backs of fields or down lanes to get as close to their stand as possible, they now walk from the house. The only exceptions: electric golf carts or utility vehicles such as the Stealth, which I recently tested. We used to do drives during midday throughout the season, but now we reserve those for the final week in order to limit activity as well. The result has been dramatic. When our neighbors use their trucks and run all over the properties around us, the activity pushes deer onto our place, where we are spotting them more throughout the season. In addition, treat your entire hunting time as if it were archery season by wearing rubber boots and spraying down with scent-eliminating sprays such as Code Blue EliminX or Primos Silver XP. Don't bust through areas where deer might be bedded; rather, take the quietest and most direct trail to your stands both in and out every time. When walking with a hunting partner, keep voices low and talking to a minimum. The sound of talking carries much farther than people sometimes realize, particularly in the early morning and late evening when the air is cool and dense. A lot of guys decide they want to hunt a particular stand or food plot because a big buck has been seen in the area or large numbers of deer have been moving through, but no matter how much promise a stand might offer, never hunt it if the wind isn't right. Even when you are hunting with a rifle, your scent can be picked up by deer more than 100 yards away. Go into an area where a big buck has been working, and if he winds you just once, he is apt to change his pattern or go nocturnal. Check the wind before you select your stand using a map to confirm the relationship of your hunting location to the area you will be watching. Always carry a wind checker, such as Hunter's Specialties' Windicator powder, to check wind periodically while in your stand and prevent having your presence betrayed by swirling breezes. Real Deal Taxidermy's David Sichik shoots hunting videos on the small properties common to his native New Jersey and has found success creating sanctuary areas on properties as small as 60 or 70 acres. "I'll pick an area that has a lot of cover for bedding and protection and won't go into it all season," he says. Sanctuary areas as small as five acres can be effective in providing deer with the security they need to remain on a property, and they'll even gravitate there from neighboring tracts. On larger hunting lands, multiple sanctuary areas of 10 to 20 acres spread around the property and located near easily accessible food sources are even better. Resist the urge to enter these areas even as deer activity slows throughout the season. Instead, locate active deer trails that go in and out of the sanctuaries toward food plots or oak flats, and set stands along these travel corridors near the fringe of the protected area. Then you can catch deer moving in and out of them at first light or just before dark. One of the biggest quandaries many hunters face is the question of how many times in a row or how frequently a stand should be hunted. Some hunters and guides are of the school of thought that to minimize the effects of hunting pressure, you should never hunt a stand two times in a row. "You have to give a spot rest because deer will quickly clue on to you going there," says Fred Law, deer hunting manager at Enon Plantation in Alabama. 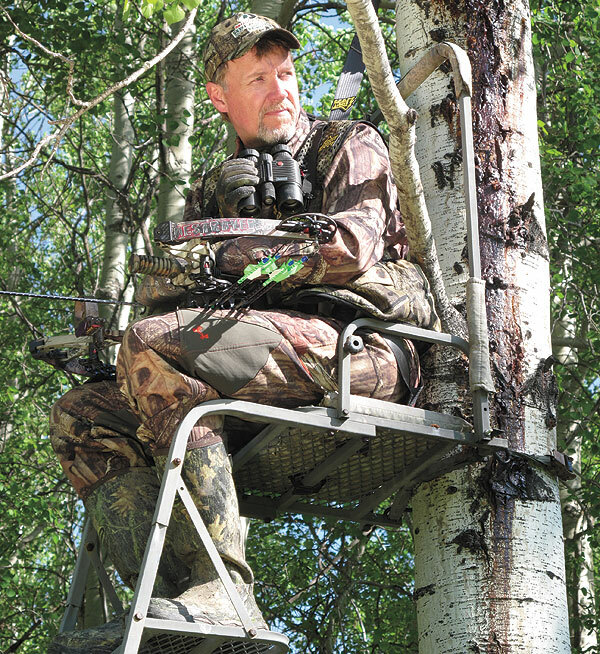 "Going there repeatedly lessens the odds of seeing the deer you want." Generally, Law and his guides won't put a hunter in a stand that has been hunted in the past four to five days. Enon's holdings are also large enough that the property has been divided into four tracts, each one rested after a group has hunted it until all four have gone through a rotation. Aaron Volkmar of Tails of the Hunt in Iowa has a slightly different approach, particularly later in the season as deer focus their attention on remaining food sources. "When deer are in an area, you have to hunt it. It's that simple," Volkmar says. He will put hunters on a stand or blind in the same area days in a row as long as they are seeing deer. To minimize the impact of their presence, he doesn't allow guides to drive them all the way to their stands and encourages all-day hunting in order to limit the amount of coming and going that can disturb deer. The key is to simply limit your impact in a particular area. If you believe a stand will produce, hit it when it's right, and if you see deer moving but don't get a shot and want to return the next day, do so only if the wind conditions and your timing are such that you can get in and out without being detected. I would hesitate hunting it more than that without giving it a rest. "Whether or not you realize it, your scent builds up in an area you have been sitting in, and each time you go in and out you rub [your scent] up against limbs and trees. The deer know you've been there," Law says.